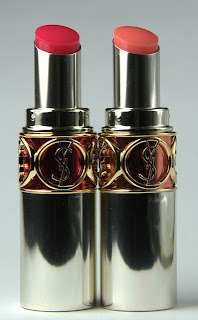 Yves Saint Laurent Volupté Sheer Candy - Succulent Pomegranate and Dewy Papaya swatches! Honestly, when I first saw these lipsticks, I wasn't expecting them to be much more than overpriced lip balms but was I ever wrong! Yves Saint Laurent Volupté Sheer Candy look like they wouldn't have much colour to them at all but for something that is meant to be sheer, I was impressed with the amount of pigmentation. On top of that, they smell amazing (mango) and feel super moist on - these already have a home in my purse and I can see them being my summer staple! 4 Succulent Pomegranate - love the colour, like I've been sucking a berry! 2 Dewy Papaya - it's not a lot of color but perfect for when I want a natural look and still want the moisture and super shine! succulent pomegranate is gorgeous! i was hoping for more of a peachy colour for dewy papaya but the shine is just lovely. Wow these are gorgeous! They seem a lot more pigmented compared to the names. How would you compare these to the Chanel Rouge Coco Shines? Oh my gosh do I want that Dewy Papaya! Succulent Pomegranate looks so pretty! I love how they look, very nice! I love these color ! the pink pomegrenate is gorgeaous, that's my faves. 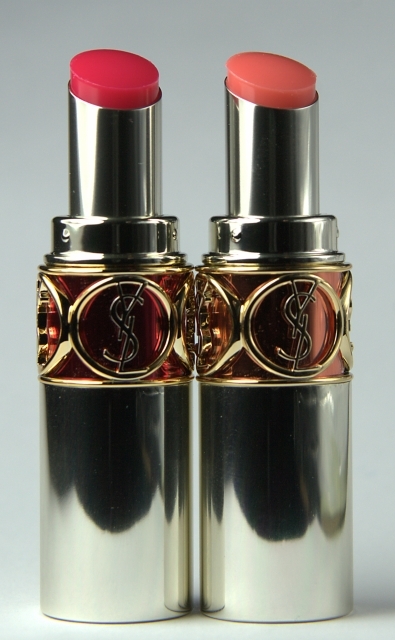 and YSL has best sticks i tried. I love it !